When you say your wedding vows, you expect to spend the rest of your life with that person, til death do you part. But what happens if death comes sooner rather than later? What if you are still young when the one person you love the most in the world, the one person who believed in you over everything, dies suddenly, leaving you alone? How do you go on? How do you define yourself? Who are you now that you're not part of a couple? 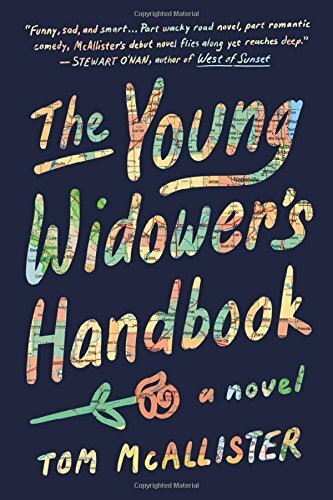 Tom McAllister's touching novel The Young Widower's Handbook asks these questions even if it can't quite answer them. Hunter Cady is a little bit aimless and unmotivated. His wife Kait is the one person who believes in him and makes him want to be better. So when she dies unexpectedly while they are still in their twenties, he is set completely adrift. Her crazy, thuggish family blames him for her death following an ectopic pregnancy and they want to claim her ashes. Instead, Hunter takes off with them, embarking on a cross country tour, visiting the places that he and Kait had jokingly suggested they might move to one day. Sunk in his grief, he tells no one where he's gone or where he's headed, just sends photographs of himself holding Kait's ashes at stops along his way to family and friends via social media to reassure them he's still out there. As he travels the country without any clear plan, he runs into quirky people, has odd encounters, and gains some insight into their marriage and the love that he still has for her while trying to learn how to go on without her. Hunter as a character is not always good and he doesn't always make the best decisions but he's grieving an unimaginable loss and is understandably gutted and numb after Kait's sudden death. In fact, Hunter is completely and totally human, flaws and all, and while this sometimes makes him unsympathetic, most of the time, the reader can understand his thoughtless actions and his lack of consideration for anyone else who cared for Kait. The road trip itself, with its random, unplanned stops and detours, is clearly a metaphor for the emotional journey he's on but it never verges on cliched. The pacing of the novel and the revelations of Hunter and Kait's life together and their now lost plans for the future are woven together well into a lovely and coherent whole. The writing here is beautifully done; the story itself is bittersweet without being sentimental and the ending will tear your heart out with its beauty and its rightness. Thanks to the publisher for sending me a copy of this book for review.